Information Communication Technology (ICT), according to United Nations Development Plan (UNDP) 2001, has been defined to include the full range of electronic technologies and techniques used to manage information and knowledge. The speed with which ICT is developing and its impact on socio-economic activities cannot be overemphasized. It is a stark fact that the use of ICT has been integrated into virtually every facet of commerce, governance and civic activity in developed countries and has become a critical factor in creating wealth worldwide. This spread which has undoubtedly brought such a renaissance in all spheres of life has also had a rippling effect on education as well. Tesfay (2008) states that ‘‘providing citizens with quality education is the means by which the socio economic development of a country can be achieved. Introducing information technology in educational system can play a vital role in promoting such an improvement.’’ (p.1). According to him, the ultimate goal of introducing ICT in the education system is to use ICT as a tool in the teaching and learning process across all subject areas of the national curriculum. Ghana’s national development strategy (Government of Ghana, 1995) emphasizes the use of information and communications technology (ICT) to accelerate the socioeconomic development of the country. In furtherance of this national goal, a national commission on ICT was set up in 2002 to develop a national ICT policy. The report of this commission is what is now known as the Ghana ICT for Accelerated Development Policy (ICT4AD) (Republic of Ghana, 2003). The ICT4AD policy statement therefore sets out the road map for the development of Ghana’s information society and economy. It provides a basis for facilitating the socio-economic development of the country in the emerging information, knowledge and technological age. However, promoting ICT in education by deploying and exploiting the potential of ICT in education is one of the fourteen (14) identified pillars of the ICT4AD policy. The education sector is expected to modernize the curricula at all levels to cater for the integration and introduction of computer-technology studies and the use of technology in teaching and learning. Technology use for teaching and learning is gaining acceptance in education globally; however, a formal integration of ICT in education in Ghana is still an ongoing process. According to the ICT4AD document, a survey showed that the level of computer literacy and awareness in the country is very low and this has been identified as one of the key factors limiting the development of the ICT industry and the education sector.The national policy therefore acknowledges the need for ICT training and education in the schools, colleges and universities, and the need to improve the educational system as a whole. As part of the ICT4AD mission, therefore, Ghana seeks to transform the educational system to provide the requisite educational services and environment capable of producing the right types of skills and human resources required for developing and driving Ghana’s information and knowledge-based economy and society. The Government is therefore committed to a comprehensive programme of rapid deployment; utilization and exploitation of ICT within the educational system from primary school upwards (Republic of Ghana, 2003). The policy is described as the roadmap for Ghana’s ICT utilization in the education sector and therefore identified the Ministry of Education, Science and Sports, the universities, polytechnics, colleges and research institutions, and local and foreign educational and training provision organizations as the key implementation agencies, players and stakeholders. However, the pre-tertiary teachers’ computer-based technology literacy levels are generally believed to be very low or nonexistent, and most faculty members in all public universities do not use computer-based technologies in their classrooms. Therefore, the universities in Ghana have a leading role to play in the realization of the dreams specified in the national ICT policy, particularly in training and education of an ICT literate workforce for the information-dependent economic environment that the information revolution has ushered us into. In particular, the University of Education, Winneba and the Faculty of Education of University of Cape Coast were charged with the responsibility of producing graduate teachers who will teach in and administer the pre-tertiary institutions of Ghana’s educational system. The Faculty of Education of the University of Cape Coast (UCC) and the University of Education, Winneba (UEW), as tertiary teacher education institutions, accepted the challenge to produce technologically literate graduate teachers to meet the national educational goals. The UEW in particular designed an elaborate Information and Communication Technology plan, spanning over five years (2003-2008) to meet this challenge. The UCC had a similar ICT plan (2002 – 2007). Both universities have made huge investment in technology facilities and infrastructure in the past seven to eight years to enrich their teaching and learning environments. As the gatekeeper of classroom change, the teacher has the responsibility to make appropriate use of technology in teaching and learning and to make sure that students are prepared for a digital future (Dawson, Bull & Swain, 2000; Hope, 1996). As Meyers (1999) has noted, one of the mistakes that has been made in implementing educational technology was focusing first on students, rather than on teachers. It is true, if teachers feel skeptical about the power of technology, it is unlikely that they will effectively integrate technology into the curriculum. Therefore, understanding teachers’ perceptions of technology integration and knowing what stimulates or inhibits them from effectively using technology in their classrooms is extremely important (Becker, 2001; Byrom, 1997; Dwyer, 1994; Ehman & Glenn, 1991; Fontana, 1997; Hope, 1998; Meyers, 1999; Rice, Wilson & Bagley, 2001; Shaver, 1999; OTA, 1995; Hsiung, 2002; Zhao & Cziko, 2001). With technology integration increasingly advocated by government, reformers, professors and teachers, many studies exploring teachers’ concerns and perceptions of technology infusion into the classroom have been published in recent years (Atkins & Vasu, 2000; Becker, 2001; Keiper, Harwood & Larson, 2000; Owens, Magoun & Anyan, 2000; Rice et al., 2001 ). However, few studies have investigated in depth how teachers use technology in the classroom after they have been exposed to some technology integration training, and even fewer have explored how such training affects the classroom instruction of social studies teachers. Many social studies teachers have attended state initiated in-service technology integration training programs, yet research by Anderson and Becker (2001) indicates that social studies teachers are not using technology as expected. It is not just acquiring the knowledge of ICT that is important but ICT used appropriately can stimulate the development of higher cognitive skills, deepen learning and contribute to the acquisition of skills needed for learning all life long and for working in today’s job market (Tchombe, Maiga, Toure, Mbangwana, Diarra & Karsenti, 2008). Many researchers have indicated that there needs to be more studies that examine teachers’ perceptions of and experiences with technology integration. (Ehman & Glenn, 1991; Pedretti, Mayer-Smith & Woodrow, 1999; Saye, 1998). Given this acknowledged low rate of technology use in social studies curriculum, it seems necessary to investigate social studies teachers’ perspectives of technology integration, to understand why and how they use technology in the classroom, and to explore what successes and challenges they encounter in the process of implementing technology-connected lessons. It is unlikely that we will be able to ‘measure’ social studies teachers’ successful use of technology without descriptive studies of their experiences of using it. It is against this background that this study investigates into how senior high school social studies teachers of the Cape Coast Metropolis perceive and integrate technology in their classrooms. The origin, nature, and purpose of social studies have been strongly debated throughout the twentieth century (Barr, Barth, Shermis, 1978; Ross, 1997). In spite of competing curricular traditions within the social studies, in the closing of his presidential address at the 1999 NCSS Annual Conference, Richard Theisen captured the essence of the social studies; "We have a mission, the education of children and young adults for citizenship" ( Theisen, 2000, p. 6). This he explains, is specifically to develop citizens who have the knowledge, skills, and dispositions necessary for informed and active decision making on public and private matters of social concern (Engle, 1960; NCSS, 1994; Ross, 1997). This is in line with Association of Africa Social and Environmental Studies Programme, (ASESP, (1999) definition which states that “Social Studies is citizenship education” (p.2). Many social studies educators have argued that preparing students for the responsibility of the office of a citizen is in fact the perfect place to let students learn to critically explore their world through the use of interactive technologies (Braun & Risinger, 1999; Cogan, Grossman, & Lei, 2000). That is, having access to up-to-date knowledge resources, archives, and experts via information technology can only benefit a teaching field that (a) has begun to recognize the important implications for teaching and learning social studies from a constructivist perspective (Alleman & Brophy, 1998; NCSS, 1994) and (b) stresses the importance of allowing students to develop the intellectual skills necessary to critically unpack primary sources and to work with data sets, while investigating and inquiring into past and present issues (White, 1997). Diem (1999) suggests that the challenge for the social studies teacher is to find "how to use the new tools and techniques in ways that will increase content understanding and hone the skills needed to effectively use technology" (p.2). Such a challenge, Fontana (1997) argues, must be undertaken quickly by social studies educators, if the discipline of social studies is to maintain its vitality, direction, and integrity. This sense of urgency and concern that comes with failing to utilize technology is easily understood when one begins to explore the actual use and impact of interactive technologies in the social studies, and on the nature of teaching social studies. Cuban’s (2001) research, in fact, reveals that across all disciplines including the social studies, computer technology has not been seamlessly integrated into the classroom and where it is used, little evidence exists to suggest that it has transformed the teaching and learning process. In fact, Cuban notes that the relatively small numbers of teachers who do use computers proficiently appear to primarily use technology to “maintain existing classroom practices” (p. 171). Specifically, within the social studies curriculum, technology has been likened to a sleeping giant. (Martorella, 1997). A giant because many social studies educators contend that interactive technologies hold a great deal of potential for the teaching and learning of social studies, yet sleeping because little technology research, development, and implementation has taken place among social studies educators (Ehman & Glenn, 1991). This becomes apparent when one takes into consideration that social studies as a teaching field has been observed by generations of students and researchers as clinging to a specific patterned genre of teaching (Goodlad, 1984; Shaver, 1999). It is a pedagogical genre in which the teacher talks and students listen, where students are directed to read and answer questions in textbooks and are then expected to memorize facts and details which for the most part are “removed from their intrinsically human character” (Goodlad, 1984, p. 212). That traditional social studies teaching is “yoked to the textbook, captive to talk and chalk” (Hope, 1996, p. 150) does not bode well for those who are challenging social studies educators to integrate technology. Despite the potential of computers to provide learning opportunities ranging from drill- and – practice exercises to exploratory activities, social studies educators seem to have been reluctant to integrate computers into their curriculum and instruction. According to a Teaching, Learning, and Computing (TLC) national survey reports (Anderson & Becker, 2001; Becker, 2001), Social studies teachers and mathematics teachers were among the least likely to use technology (12% and 11% respectively) and the least likely to involve students in higher order thinking activities. A more recent research conducted by Gulbahar, Y., & Guven, I. (2008) on computer usage by social studies teachers in Turkey was found to be as follows: 53.1% uses a computer for less than one hour, 30.7% uses a computer for between 1 and 3 hours, 2.8% uses a computer for between 3-5 hours and 1.5% uses a computer for more than five hours a day. The case in Ghana, seems not to be different because related research conducted by Boakye & Banini (2008) revealed that 71% of teachers (of which social studies are included) in Ghana never use the computer in class (i.e. using a computer during class time or taking students to the computer laboratory). This means it seems that the extent to which the potential of technology is being fully utilized in the social studies classroom has not been sufficiently explored by teachers. Information and communication technologies (ICT) do not “automatically add quality to teaching and learning. It is possible to use them for trivial purposes, to waste students’ time … or even worse, use them for destructive or immoral purposes” (Dellit, 2002: 56) or to entrench differences. It is upon this underpinnum, that this research investigates into how teachers in the Cape Coast metropolis are integrating technology in the teaching of social studies. The purpose of this study is to find out the technology integration courses offerred at the tertiary level by social studies teachers. It also investigates other non-tertiary training sources that have influenced social studies teachers’ present use of technology in the social studies classroom. In addition, the study finds out the competencies derived by social studies teachers from technology integration training. The study also seeks to unravel the perception of senior high social studies teachers towards technology integration in the social studies curriculum. Furthermore, the study investigates how social studies teachers are using technology in the social studies classroom. Finally, this study inquires into challenges social studies teachers encounter in integrating technology into their classroom instruction. 1. What technology integration courses did social studies teachers offer during their tertiary education? 2. What other, non-tertiary training sources influenced these teachers’ present use of technology in the social studies classroom? 3. What competencies have social studies teachers derived from technology integration training? 4. How do social studies teachers perceive technology integration in social studies curriculum? 5. How do social studies teachers use technology in social studies classrooms? 6. What challenges do these teachers have while designing and teaching technology-connected lessons? Millions of dollars have been spent on computers, internet and teacher technology training by the government of Ghana in the University of Cape Coast and University of Education, Winneba over the past seven to eight years to train technology informed teachers to teach in our senior high schools. Education seminars by Ghana Education Service and individual secondary schools have also been organized for some secondary school teachers as well. The findings of this study will add to our general understanding of how social studies teachers perceive technology integration, and how they use technology in the classroom. This study of teachers’ technology use in the social studies classroom and detailed description of these experiences will contribute to the current literature of technology use in the social studies curriculum. One of the goals of this study is to investigate how the tertiary technology training aspect of the teacher education programme affects teachers’ instructional practice. Understanding teachers’ perspectives of this training should be able to help improve the technology training aspect of the programme. Knowledge of teachers’ experiences and perceptions of technology integration in social studies, especially the barriers teachers are coping with, may inform school administrators that better achievement will be made if teachers are better understood and well supported while infusing technology in the classroom. Furthermore, this study will also provide social studies teachers and educators an opportunity to examine their own perceptions of and experiences with technology use, thus helping them to improve their own practices and the programme. Finally, the study will also inform my fellow social studies teachers in Ghana on the need to have a positive perception and competence in technoogy and consequently use it to effectively teach social studies. Given that Ghanaian universities and schools are trying to squeeze money from their already limited educational budgets to equip classrooms with technology and train teachers, a better understanding of how Ghanaian teachers perceive and use technology after technology integration training will make Ghanaian school teachers be more aware of the potential challenges in using technology and ensure that technology is appropriately used for teaching and learning. The study should have covered the whole region, but only the Cape Coast metropolis was considered. Again, the study should have involved teachers in varied disciplines, but was limited to only social studies teachers. The study was also limited to only social studies teachers in the senior high schools. The study should have involved multiple research instruments, but only the questionnaire was used and this narrrows the broader view of the real situation on the ground. There are varied technological tools that can be used to enhance students’ learning but only a few were used as a yard stick to assess teachers on their use of technology in their classrooms. This provides findings limited to the use of few technological tools by teachers to the neglect of the others. This makes it difficult to generalize findings based on the use of all technological tools. Technology Integration: This refers to using computers effectively and efficiently by teachers and students in classroom instruction to enhance student learning and understanding. ICT Educational Plan: This is an elaborate Information and Communication Technology plan, spanning over five years (2003-2008) for University of Education, Winneba and (2002-2007) for University of Cape Coast, to meet the ICT in education policy challenge. It was to build basic computer competency and pedagogical skills to prepare technologically sound teachers who will be effective in utilizing ICT in their instruction to promote effective teaching and learning. A customized curriculum was used aiming at teachers of all disciplines. Some of the courses included information retrieval, educational technology and computers in education. The study was organized into five chapters with their sub-headings. Chapter one provides a background to the study, states the problem and purpose of the study, and provides the research questions that guided the study. The significance of the study is discussed as well as the delimitation and limitation. Some terms are defined as well as the organization of the rest of the study. Chapter two provides a theoretical framework and literature review on technology integration in Ghanaian schools, ICT facilities and access to students and teachers, technology integration training, UEW and UCC ICT integration policy plan and training, the impact of technology training on the use of computer resources, impact of technology training on social studies teachers, teacher competencies in technology integration tools, teachers’ attitudes and perception towards technology integration into the social studies curriculum, ways in which technology can be used in the social studies curriculum and challenges or barriers to technology integration . Chapter three provides the research design, describes the population as well as the sample and sampling procedure of the study. It also describes the instrument and pretest for validity and reliability as well as the data collection procedure and how the data collected was analyzed. 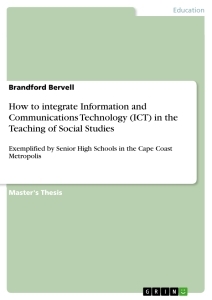 The purpose of this study is to investigate how social studies teachers who have completed some form of technology integration training perceive and use technology in the social studies classrooms. This chapter first provides a theoretical framework of the study, a brief overview of the status of technology integration in Ghanaian schools, especially in the discipline of social studies. After which importance of technology integration training has been reviewed. Competencies in technology integration tools and usage as well as teachers’ perception of technology integration in social studies curriculum have also been looked at. Finally, ways in which teachers can use technology in social studies classrooms and its related challenges or barriers involved while designing and teaching technology-connected lessons have also been considered. The theoretical framework that guides this study is constructivism. Constructivism is a philosophical school of thought that holds the view that the only reality is our individual interpretation of what we perceive. It maintains that knowledge is not received from outside, but we construct knowledge from our heads and that learning is a process of people actively constructing knowledge. Traditional instructional methods such as memorizing, demonstrating and imitating are considered incompatible with the notion that learning is a process of construction. In recent years, Papert (1980) and his colleagues have expanded this approach to the more general notion that people learn most things better through construction of computer programmes, computer games or multimedia compositions rather than through traditional methods of directly teaching content (Harel & Papert, 1991). Thus presentation of information is downplayed whereas learner activity is stressed. For example, teacher questions are discouraged and learner questions are encouraged (Jonassen, 1988). Constructivism emphasizes the learner exploring, experimenting, doing research, asking questions and seeking answers, which promotes critical thinking and problem solving skills. Another substantial aspect of constructivist thinking is an emphasis on cooperative and collaborative learning (Slavin, 1990). The more general term cooperative, means learners are helping each other rather than hindering or engaging in unhealthy competition, or ignoring one another. They may be working on individual projects (such as term papers or experiments), but the environment supports learners helping and teaching one another. Collaborative learning goes a bit further, suggesting environments in which learners work on shared project or goal. Both cooperative and collaborative environments have several advantages. Interactivity is enhanced and more multisensory (including conversation between learners and other activities, not just typing and reading), participants play roles of both learners and teachers, motivation is enhanced, social skills are fostered and met cognitive skills are improved. A criticism that constructivist educators aim at traditional and current educational environments is that the knowledge and skills taught are too simplified. Thus, they are not useful in the real world, because learners recognize them as such and are not highly motivated. Better education environments should be designed with information, problems and multiple solution approaches, such as those people encounter in their real jobs and lives (Savery & Duffy, 1995). It is in this vein that constructivists maintain that what is taught by traditional methods produces inert knowledge (Renkl, Mandle, & Gruber, 1996), which is not easily applied to new situations. In other words, traditional methods promote knowledge that does not transfer well. In contrast constructivists suggest that methodologies such as hypermedia, simulation, virtual reality and open-ended learning environments are of more benefit to learners, allowing them to explore information freely, apply their own learning styles, and use software as a resource. More importantly, constructivists support the use of computer-based tools with which learners can design and construct their own knowledge (Jonassen, 2000). Activities such as typing compositions, using simulations and games result in more useful knowledge and skills. They also emphasize using computers for communication, such as e-mail for communication between learners at a distance, Internet chat rooms and video conferencing, and file sharing for group research and project work. Information and communication technologies (ICT) have become indispensable tools in today’s information age, making a dramatic impact on the lives of people globally. This effect is most significant in education. The computer has become a motivating tool for teaching and learning in schools (World Bank, 1999). At the inception of the millennium, Ghana’s education authorities embarked on a number of projects to introduce (ICTs) into the Ghanaian education set up; especially at the basic and secondary school levels. For instance, in the middle of the 1990s, educational providers realized that Ghanaian professionals could not compete on the global market for jobs, because they were limited in skill, especially in the area of Information Technology. Subsequently, the authorities incorporated the study of ICTs as part of the study of science. The government of Ghana with the Ohio University and in collaboration with Non-Governmental Organizations (NGO), philanthropists and Parent-Teacher Associations (PTAs) built about 110 science resource centres to help the teaching of science and ICT. However, initiators found that the various programs were disintegrated, unstructured and did not cover all the schools (Nyarko, 2007). In the later part of 1990s, Ghana was host to a number of ICT initiatives supported by the government and NGOs. The Ministry of Education in conjunction with the Ghana Education Service (GES) and its allied partners undertook a critical situational analysis and review of the utilization of ICT in education under the auspices of the United Nations Global E-Schools and Community Initiatives (GESCI). Many lapses were identified for which the stakeholders agreed to work together to make education complete with ICT as a facilitator. According to a Ghana News Agency (GNA) July, 2004 report, - Ghana is making inroads in the introduction of Information and Communication Technology (ICT) into Education, Mr. Kwadwo Baah-Wiredu, the then Minister of Education said in Abuja. Mr. Wiredu said some of the basic schools in almost all the district capitals have ICT while most private schools no matter their location whether in the rural or urban setting have ICTs commonly called the computer centres. For example, he said, Data Link, an ICT company is linking various schools in the Tano District of the Brong Ahafo Region to the computer and the Internet. The then Minister said over 300 out of the 476 senior secondary schools (SSS) in the country have one form of ICT facility while all the 38 teacher training colleges are being hooked onto the ICT. In addition to all these, the Government of Ghana signed a memorandum of understanding with the Microsoft on the Partners in Learning Programme on March 6, 2004 to provide schools in the country with software to upgrade the operating systems (GNA, 2004). The government of Ghana, in order to create the enabling environment for the use of ICT in the area of education, a Wide Area Network called the Research and Educational Network (REN) was established in 2000 with the help of the World Bank INFODEV project. Presently this basic infrastructure is functioning satisfactorily with the University of Ghana, hosting the main server and linking up other institutions such as University of Cape Coast, Kwame Nkrumah University of Science and Technology, University of Education Winneba, Center for Scientific and Industrial Research, Ghana Atomic Energy Commission and University for Development Studies. The nodes are also serving as service providers to the senior secondary schools that use the dial up access to reach these nodes. (Government of Ghana, 2003). Other developments have been establishment of computer laboratories in most secondary schools in the country. Teachers have been urged to integrate technology into school curriculum by the media, teacher education accrediting organizations, professional development programs, teachers, parents, and administrators. National reports and literature reviews (Kulik, 1994; Ringstaff & Kelley, 2002) all indicating that technology can help improve students’ performance on tests and academic work, promote higher-order thinking skills, and increase students’ motivation and self concepts. Another important variable of ICT integration in schools is availability of ICT infrastructure. In his doctoral dissertation, Ottesen (2006) revealed that one fundamental problem facing ICT integration in schools is the lack of computer infrastructure. In a related study, Norris, Sullivan, & Poirot, (2003) revealed that appropriate access to technology infrastructure is another key factor in the effective technology integration process. The study revealed substantive correlation between technology access and use. In another study, Yildrim (2007) revealed that teachers agreed that access to ICT infrastructure is one of the effective means to integrate ICT in classrooms. Through ICT, curricula can be more easily updated, adapted, enriched and personalized to satisfy a broad range of learning needs. Using ICT access to a curriculum can be made available more efficiently over a wider area. Even within more traditional learning environments, ICT is changing the way classrooms operate; the integration of multimedia subject presentations, online research, changing teacher-student dynamics, and innovative project approaches are making the learning process more interactive and participatory (UN Youth Report, 2005). Teachers, even though might have access to technology, its effective use will however warrant a knowledge in their application through training. A large body of literature (Berson, 1996; OTA, 1995; Redish, 1997; White, 1997) supports the idea that the biggest obstacle to teacher infusion of technology into the classrooms is the lack of adequate teacher training. Research reveals that one-third of elementary and secondary teachers have only 10 hours of computer training (Braun, Fernlund & White, 1998). Without adequate training of how to use technology, teachers will feel timid and not be able to successfully use computers as a powerful tool to transform instructional practices. It is generally agreed that computer training can lead to both cognitive gains and more positive attitudes toward computers (Amy, 2000; Keiper, Harwood & Larson, 2000). Once teachers master the skills of the technology and acquire confidence and control over the technology, they will feel prepared to use it in their classroom, and their frustration will be substantially reduced or eliminated. According to Redish (1997), “If teachers lack the knowledge and skills that are necessary to integrate technology effectively into the curriculum, technology may never realize its potential in the classroom” (p. 3). She also noted that access to technology is critical, but it does not guarantee effective utilization, and “if teachers are to optimize their instructional potential and make the most effective use of educational technology, extensive professional development is required” (Redish, 1997, p. 3). In recent years, many states have started professional development programmes to equip teachers with the skills needed to incorporate technology into classroom teaching and learning, mandated the integration of technology in the classroom, and issued a great number of initiatives to encourage technology use (Sheumaker, Slate & Onwuegbuzie, 2001). New technology is being introduced so rapidly today that it is very unlikely that a teacher will keep up with it on his or her own. For this reason, professional development of teachers is urgent and important (King, 2002b). It is in view of this that the UEW and UCC introduced the technology integration training as part of their curriculum. The University of Education, Winneba (UEW) started its ICT programme in the 1998/99 academic year when a new Vice Chancellor (Prof. Jophus Anamuah-Mensah) assumed office. The UEW developed and started implementing a five-year (2003-2008) ICT Strategic Plan in 2003/2004 academic year. Among other things, this plan emphasized the development and deployment of ICT tools for teaching and learning. In furtherance of this institutional goal, a series of ICT workshops were organized as part of a faculty technology professional development programme. These workshops aimed at conscientizing faculty on the benefits and demerits of ICT as instructional and learning tool, and equipping faculty with basic ICT skills and knowledge. The university encouraged individual faculty to own their personal computers (PCs) through a hire purchase arrangement with a computer vendor. The University in partnership with FLOSS4Edu and One Village Foundation, Ghana with support from the Partnership for Higher Education for Africa established the Open Educational Content Development Project to develop and share digital educational content within the university community (students and faculty) and the WikiEduator Community. So far, 81 faculty members have been trained on online content creation and their course materials are already uploaded to the servers of this project. Realizing that more than 90 pre-service teachers enter the university with little or no ICT literacy skills, the university has developed a core ICT Course (GDP 113: Introduction to ICT) which all trainees must pass as a requirement for graduation. All masters (graduate) students are also required to pass EDI 502: Introduction to Information Technology in Education as part of their graduation requirements. The ICT Center is responsible for teaching both GPD 113 and EDI 502 core courses for the undergraduate and graduate students, respectively. Starting 2004/2005 academic year, the University introduced Diploma (ICT Education) and B.Ed. (ICT Education) programmes at its Kumasi Campus. The ICT plan has also encouraged every faculty and Department to design department-based ICT programmes with the main objective of integrating ICT into their curricula. Lecture halls have been equipped with multimedia PCs, digital projectors, classroom seating arrangement to make interaction with learner more effective, easy access to the Internet, and access to computer labs (ICT center and computer labs, Carnegie sponsored café, graduate lab) though not enough to have helped educators in their use of ICT (Mereku, Yidana, Hordzi, Tete-Mensah, Tete-Mensah, & Williams (2009). The University of Cape Coast (UCC) on the other hand started implementing their ICT policy plan in the 2002/2003 academic year. The implementation saw the establishment of a computer laboratory and the provision of internet facilities on campus. All students were therefore expected to acquire basic ICT skills through the ‘computer literacy for everyone’ programme. User support has been provided in the form of informed help on academic and administrative computing and information to all categories of staff and students. The challenge however has been the provision of support for undergraduates to ensure successful computer literacy for everyone. Additional to the student support, appropriate incentives and support packages have also been made available to faculty and staff as encouragement in the creative use and application of ICT for teaching and research. Furthermore, a reliable university wide internet backbone has been provided and Local Area Networks (LAN) on campus connected into a Campus Wide Area Network (CWAN). In order to ensure its effective use, senior members and staff have been trained to electronically publish as well as searching for data. In support of this, the departments have also provided academic staff with desktop computers to help facilitate teaching and learning as envisaged in the mission of the ICT policy (UCC ICT Policy Document, 2002). Furthermore, UCC has also made huge investments in multimedia equipments to be integrated in the curriculum of the university. Courses such as information retrieval (especially computer and internet use) was introduced as compulsory for all undergraduate first year students. Education level 300 students also offer a course known as educational technology, which is aimed at training education students on the various multimedia available and how they can be effectively integrated into classroom interaction to enhance learning. In addition to this all students were given free training sessions on Microsoft office suite (Word, Excel, Powerpoint) and internet orientation. At the graduate level, all education masters students offer a course in computers in education, which is supposed to further enhance their knowledge and skill in how to effectively utilize the computer and technology in their classroom activities (UCC ICT Policy Document, 2002). All these developments have been implemented with the rationale of training students who will graduate as professional teachers to utilize technology as an effective tool in the classroom. The main success stories in ICT in education is in the area of providing basic ICT Literacy skills for all first year and graduate students in all faculties of UEW and UCC. This has greatly encouraged graduates to become life-long learners in technology education; a feat ascribes to UEW and UCC students (Boakye & Banini, 2008). Research has shown that teachers who have more experience with computer technology are more comfortable using it and have positive attitudes towards computer technology resources, while those with computer anxiety tend to avoid using them (Akbaba & Kurubacak, 1998). The expansion and success of instructional technology, then, depend greatly on teachers’ attitudes towards and ability to use them in their instruction (Clark, 2000). Some researchers found that provision of opportunities and training to enable teachers to experience computer technology resources and learn how to use them in instruction is crucial for teachers' acceptance and use of them (Clark, 2000). In a study of accomplished teachers who integrated computers in their classrooms, Sheingold & Hadley (1990) found that teachers in their study had taken advantage of in-service training opportunities as well as completing training on their own time. What are the anticipated impacts of providing technology training for teachers? It would appear that computer anxiety is lessened by exposure to computers through training and use. Yildirim (2000) found that technology-competent teachers had significantly more positive attitudes, more confidence, and less anxiety toward computers than less competent teachers prior to completing a computer literacy course. Following the completion of the course, however, group differences disappeared, indicating training made a difference. In another pre-test post-test study of computer anxiety and attitudes toward computers, Hakkinen (1994-95) found that the pre-service teachers in his sample had reduced computer anxiety, higher estimation of their own computer skills, and more positive thoughts and feelings related to computers after completing a basic computer course. Ropp (1999) also found significantly reduced computer anxiety following instruction. Kluever, Lam, Hoffman, Green, and Swearingen (1994) concluded that teachers who participated in technology training also showed improvement on attitudes toward computer post-test scores. From this research, it would seem that exposure to training would reduce or minimize computer anxiety. One of the major incentives for teachers to use computers might be to convince them of the benefits of technology in social studies instruction. As teachers become convinced of the learning benefits that may result from the adoption of new instructional practices, they may become more motivated to adopt these practices. As the above review of research has revealed, the way to convince teachers is to provide them with models, opportunities and training support. Jones (2001) identifies the same issue and argues that in order to better exploit the rich potential of computer assisted instruction schools should provide teachers with adequate training and time to develop pathways for incorporating technology into instruction and student learning. However, training which is not subject specific but generic may fail to equip social studies teachers with the requisite technology integration skills. This is because back in 1984, Glenn and Rawitsch claimed that social studies was not the focus of in-service education on computers, and that the training that does exist failed to meet social studies teachers’ needs. Interviewing 51 social studies teachers in six high schools in Midwest, Schug (1988) concluded that, a large proportion of teachers reported having participated in technology training programs, but implied that the training was inadequate and they failed to understand the importance of using the computer as a powerful tool in teaching social studies. VanFossen (2001) reached the same conclusion on a survey of Indiana secondary social studies teachers’ use of the Internet in their teaching, after a training programme. In view of this development, Pye & Sullivan (2000/2001) argued that professional development programs need to offer appropriate opportunities necessary to integrate technology into the social studies classroom. The same argument was made by Schug (1988), that for social studies teachers to change their practice and to use technology in the classroom, intensive efforts should be focused specifically on social studies teachers, and there should be specialized and in-depth training for social studies teachers with a focus on available software and new technology applications related to social studies. Despite the generic nature of technology training, teachers are all the same expected to possess some competencies to be able to effectively tailor their lessons around technology. Case study: Hewlett-Packard – Any chance to beat its global competitors?